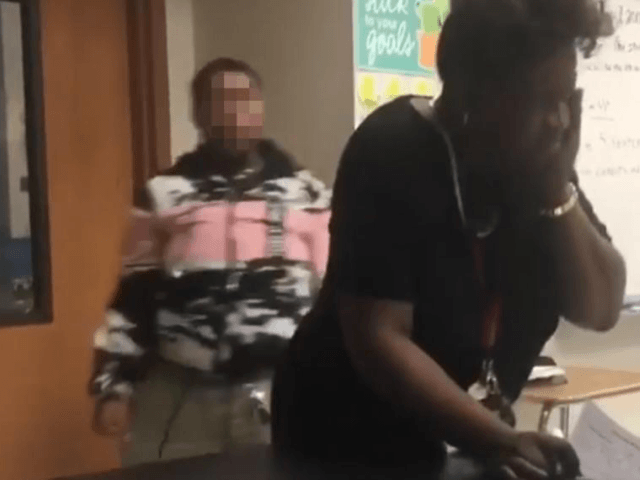 The video shows the student at Frederick Douglass High School getting into a verbal altercation with the teacher when the situation escalated. “F*** is you talking about? Don’t f***ing get smart with me, straight up,” the student said, pushing another student before punching the teacher on the side of her face. “I didn’t get smart with you,” the teacher replied as she left the classroom to follow the student. The video ends with several students shouting, shocked at what they just saw. Ivan Baker, who posted the video on Facebook on Wednesday evening, said the teacher had just returned to the classroom after taking leave for cancer surgery. The video has gone viral, gaining more than 3.4 million views as of Thursday evening. School administrators at Frederick Douglass High School continue to investigate a physical altercation that took place today when a teacher was struck by a student following a verbal exchange. Ensuring a safe teaching and learning environment for our students and staff is paramount to City Schools. Upon reviewing the incident, school administrators will apply disciplinary action in accordance with Baltimore City Public Schools’ Code of Conduct. WBAL reported that the teacher in the video is a highly-respected high school science teacher and church leader. The teacher did not return to class Thursday, and it is unclear when or if she will return to her classroom at Frederick Douglass High School, according to WBAL.